So we survived another grueling week of Comic Con. It was great seeing everyone again and meeting new people in the toys scene. 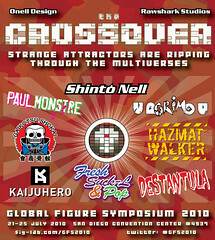 We would like to send an especially big THANKS to the legendary Paul Kaiju for being our gracious host for the week and also Don of Fig-Lab, Matt from Onell, and Jesse of Rawshark for letting us participate in the Global Figure Symposium 2010. One of our most exciting projects for the con was a collaboration with Real x Head, If you weren't able to pick one up there will be more releases in the future so keep an eye out. All MH product that didn't sell at the con is up in the shop right now. If you don't already frequent those sites, shame on you. as well as any other random time around the booth! We have lots of handpaints, three new resin sculpts, and a supersweet collaboration with RealxHead!